Tomorrow – the 21st December – is a special day for me. It comes every year and always promises a new start, a return to life. It’s the winter solstice, the shortest day of the year. A longer day must follow the shorter day, bringing with it the promise of spring. Beekeeping keeps you in touch with the seasons. 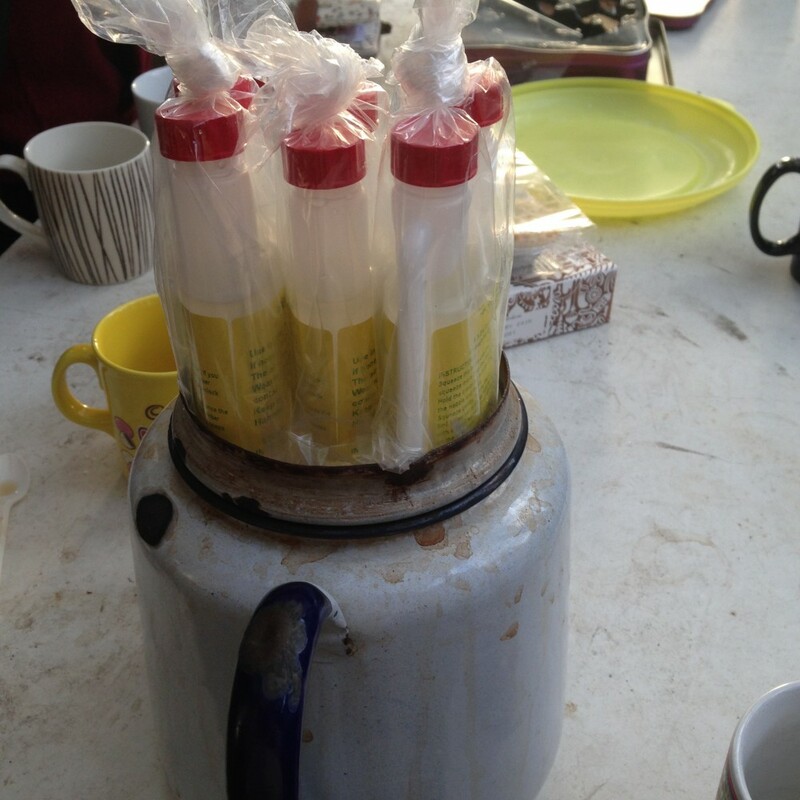 Today was a bright crisp day as Emma and I, with the help of two beginners, opened up the hives to apply oxalic acid. The bees are alive in all four hives and look fine, with the clusters on average covering about four to five frames. Mostly the bees seemed to be near the top of the hives, feeding on the fondant. Above you can see us warming the oxalic acid over the teapot, an idea Elsa had. It’s nicer for the bees if the acid isn’t dead cold. And here is Brian talking to a young man who was visiting the apiary for the first time (I’m sorry, I have a terrible memory and can’t remember his name – perhaps Stefan?). 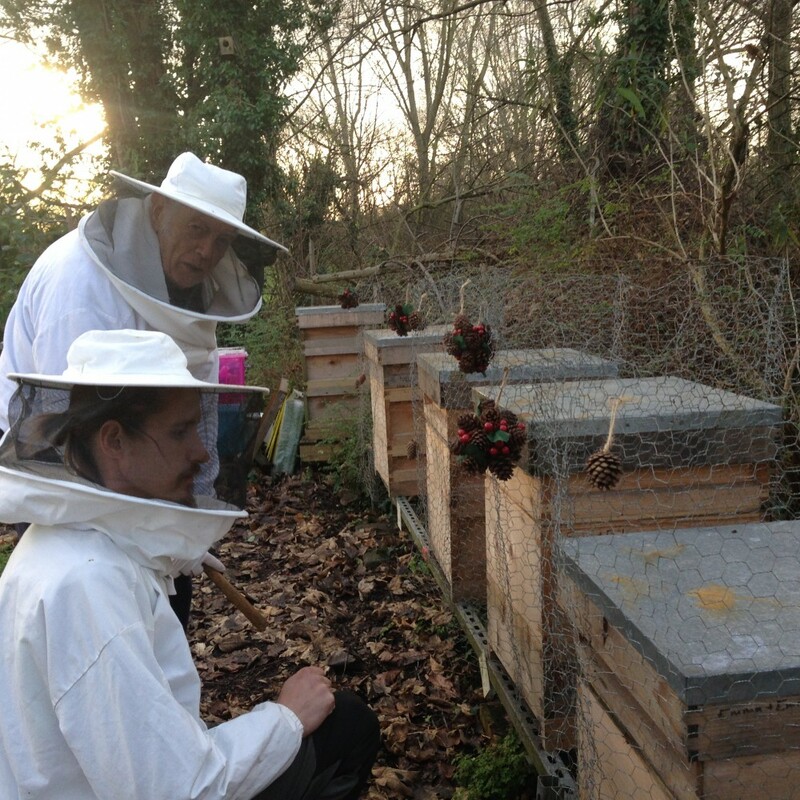 Emma has beautifully decorated the hives with garlands of cones and berries. I think we can safely claim to have the best hives in the apiary, along with the best bees (deliberately provocative statement in case any Ealing beekeepers are reading this). John Chapple gave us some useful advice on putting on additional fondant. No need to wait until the bees have finished their fondant block. Instead, cut a hole in the middle of the old block’s plastic wrapping top. Cut a corresponding hole in the middle of the new block. Put the new block on top of the old fondant block so that the two holes meet and the bees can climb up into the new block once they’ve finished eating the old fondant. Queen’s Garden, Episode 1: The first of two programmes in which Alan Titchmarsh gets exclusive access to the royal gardens at Buckingham Palace for a whole year. He watches the garden change over the four seasons and reveals its hidden treasures that have evolved over five centuries. In the first part, he arrives along with 8,000 others to attend the Queen’s summer garden party, but unlike the other guests, he has a different itinerary. He begins by venturing into the garden’s wilder spaces where nature has been left to rule. He meets the Queen’s bee keeper John Chapple, delves into the history of the garden and finds its oldest tree. Late summer is the ideal time to visit the rose garden with its 18th century summer house. Later, as Christmas arrives, Alan helps royal florist Sharon Gaddes-Croasdale bring in plants to decorate the palace. Pretty impressive – but I shouldn’t be surprised as John is true beekeeping royalty. Here’s some mince pies I made. I did two lots this week, one with a plain shortcrust pastry and this batch with ground almonds and icing sugar added, which makes for a rich, crisp pastry. Not sure which I prefer – more experimentation and eating needed! The days enlarge ever so gradually. But out in the apiary we saw green shoots – probably snowdrops – at least a couple of weeks earlier than usual. Anyone else seen signs of spring already? This entry was posted in Uncategorized and tagged bees in winter, John Chapple. Bookmark the permalink. I’ll be doing the acid thing on Christmas Eve and raising a glass of port to the girls ! Best hives and best bees, also best decorations. I think that is sweet. The bees must be very pleased. how exciting! I’m glad to hear your bees are doing well! Definitely, they will be keeping all five of their eyes on the length of the days. Hard not to be optimistic while munching on a mince pie! I can’t wait to see John & Andy in Buckingham Palace on Christmas Day! Me too! They both deserve to be featured on national telly. What a cheery thought! Thank you, that’s got me looking forward to the lengthening days already. I’m sure spring is not far away! The green shoots of the snowdrops have got me thinking it will come quickly. Thank you for the tip on fondant feeding. No probs – John is full of useful tips like that. I hadn’t realised you moved in nearly Royal circles! The mince pies look delicious; a bakery I know in Dorset puts a marzipan cover on their mince pies and they are are wonderful (in small amounts). 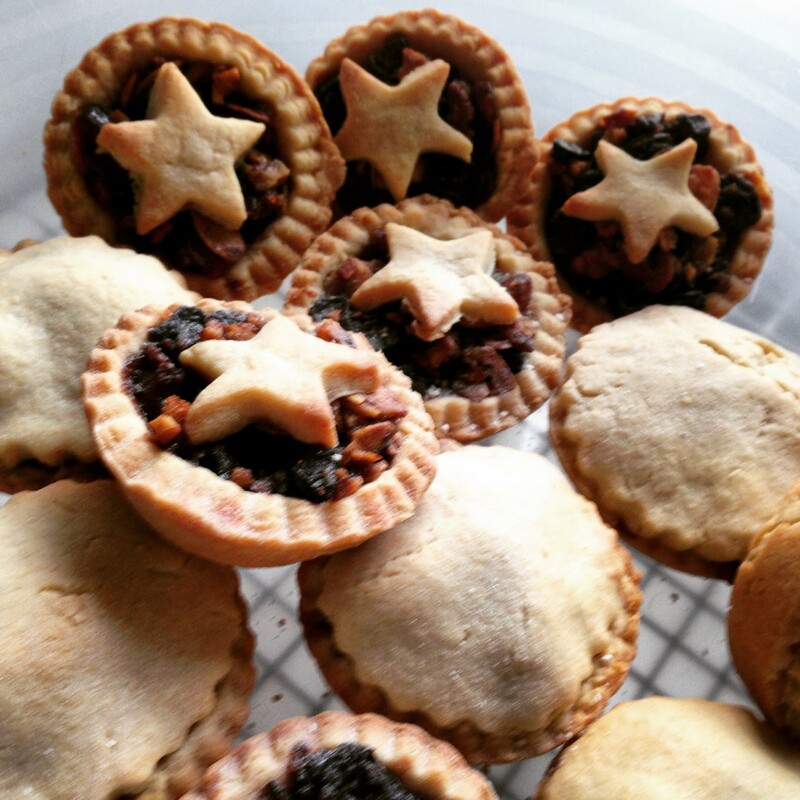 My mum has also mentioned the marzipan idea this Christmas – apparently Mary Berry did a recipe featuring marzipan topped mince pies. Intriguing.